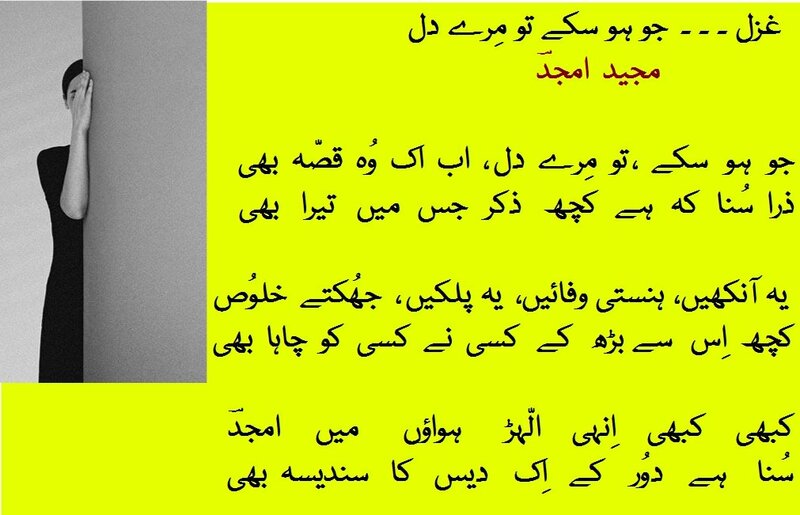 Majeed Amjad, a Pakistani modern Urdu poet, is arguably among the top 5 modern Urdu poets. He has written poems, long poems, ghazals as well as geet (songs). The images embedded in Majeed Amjad's Urdu ghazals are unprecedented in their detail . . . their delicate architecture . . . their sophistication ! Majeed Amjad displays a maestro's touch in his selection of Urdu words and their arrangement in rhythmic patterns that have turned his ghazals into monumental works of art in Urdu Literature !